Los Angeles, CA, April 19, 2017 — Mylennium, an innovative digital estate planning platform, announced today the release of a new product that helps Internet users manage their digital legacy by creating a legal document that authorizes or prohibits access to personal online accounts. 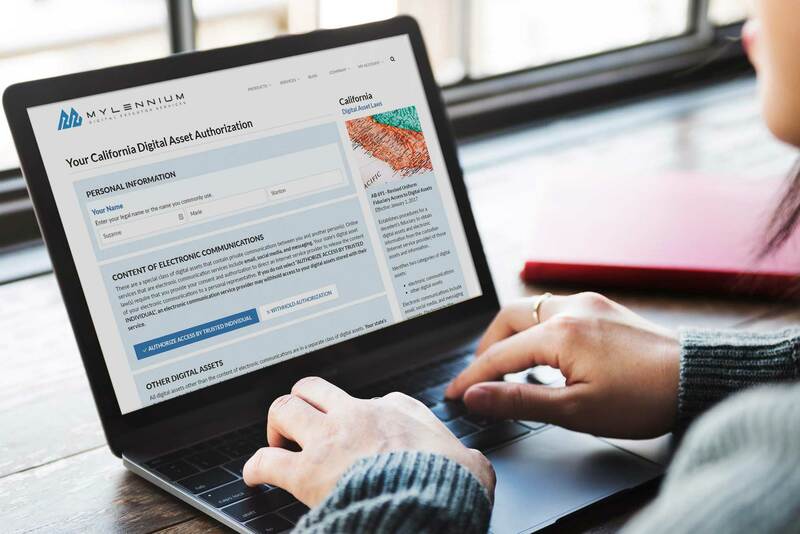 Mylennium’s Digital Asset Authorization addresses the authorization requirements established by recently enacted Revised Uniform Fiduciary Access to Digital Assets laws in 22 states with 21 additional states considering similar legislation. New digital asset laws establish a hierarchy of access to digital accounts that gives control back to the account owner if they complete a Digital Asset Authorization. If nothing is done, online accounts, including email and social media, are handled per the provider’s Terms of Service Agreement, which often results in the loss of a user’s important accounts and valuable content. The new Digital Asset Authorization gathers user responses required by digital asset laws to control a legal representative’s access to different categories of digital assets. The user has the option to authorize or prohibit access to each category of digital assets, and to identify specific online accounts the provider is prohibited from sharing with anyone, including a legal representative. The entire process takes less than five minutes after which the user receives an email with the completed document ready for their signature. Mylennium’s Digital Asset Authorization is available now for California, Florida, Michigan, New York, and Washington. A Basic Digital Authorization is priced at $24.95 and includes unlimited revisions for 30 days and an email copy of the completed document. The Comprehensive option, available for $34.95, includes all Basic features plus unlimited revisions for one year and a high-quality printed copy mailed to the customer. Authorizations for an additional eighteen states that recently enacted digital asset laws will soon be available.